THE first undersea mining in the country will take place in New Ireland and operated by Nautilus Minerals. Chief executive officer MIKE JOHNSTON explained to The National’s Business Editor SHIRLEY MAULUDU the nature of the project. He also discussed environmental aspects of the project. MAULUDU: Tell us briefly about the company Nautilus Minerals. 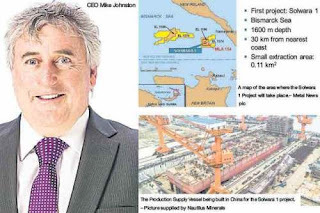 JOHNSTON: Nautilus is listed on the Toronto Stock Exchange and is the first public company to explore the deep ocean floor the world’s future mineral resources. Nautilus was granted the world’s first exploration licence for deep sea mineral resources in 1997. Our first mining lease and environment permit were granted in 2009 and 2010 respectively. MAULUDU: Tell us about the Solwara 1 project in New Ireland. JOHNSTON: The Solwara 1 project is located in the Bismarck Sea, Papua New Guinea, 30 kms from the coast of New Ireland and 1600 meters below the surface. The project uses technologies from the offshore oil and gas industry, and terrestrial underground mining to produce high grade copper and gold. The planned extractions area is very small at 0.1 km2. Additional benefits include that no tailings are produced, no landowners are required to be moved, and there is no impact from mining above 1300m water depth. The project is being developed in partnership with the PNG Government. It is fully permitted and has strong local and national support. MAULUDU: Which communities, wards or the district in New Ireland will be directly impacted by the project? JOHNSTON: As Solwara 1 is located at 1,600m water depth in the ocean, 30km from land, no one is directly impacted by the project. There is also no requirement to clear land, and no impact on tuna or coastal fisheries. An area known as the “Coastal Area of Benefit” (CAB) has been established by the provincial and national governments, where communication and community benefit programmes are focussed. The CAB comprises seven wards on the west coast of New Ireland. Only last week, Nautilus, in partnership with the NIPG, and with the assistance of Abt Associates and the New Ireland Provincial Health Authority, completed a health patrol and data collection programme (began in Oct 2016). The team estimated during this programme that they saw 7000-plus patients, out of a population of around 8500. These programmes will be ongoing. MAULUDU: What sort of tools will be used to carry out the mining? JOHNSTON: The production system uses existing technology from the offshore oil and gas sector, combined with rock cutting and materials handling technologies used in land-based operations. The mining tools cut the rock material, which is then transferred to the Production Support Vessel as a “sloppy slurry” via a very large pump and steel pipe (riser) system. On board the vessel the high grade rock is separated from the water by gravity methods. The resulting rock is stored in the ship’s hull, to be later transfer to a bulk cargo vessel, then shipped directly to China. MAULUDU: How will the minerals be mined from under the sea? JOHNSTON: Rock is cut on the seafloor by the AC and the BC, and then pumped to an adjacent stockpile area. The third machine, CM, then collects the cut material, sucking it up and transferring it as seawater slurry to the main pump, situated at the bottom of the steel riser system. The riser system comprises a rigid steel riser pipe supported from the vessel which delivers the slurry to the surface. The large subsea pump is situated at the bottom of the riser pump, just off the sea floor. The entire riser and pump system is suspended directly beneath the support vessel. On the deck of the Production Support Vessel, the slurry is dewatered using gravity. The solid material is stored temporarily in the PSV’s hull, and then discharged to a transportation vessel moored alongside. Filtered seawater is pumped back to the seafloor through the riser pipes and provides hydraulic power to operate the RALS pump. Discharge of the return water at the seafloor from where it came eliminates mixing of the water column, and minimises the environmental impact of the operation. MAULUDU: What minerals in particular will Nautilus be mining for? MAULUDU: Environmental issues have been raised by individuals, groups, regarding the Solwara 1 project. How will Nautilus avoid causing any impact on the environment within which it will operate? MAULUDU: How is Nautilus doing with its awareness programme in educating the impact communities on the nature of the project? JOHNSTON: Nautilus has always and continues to ensure that the communities located closest to its Solwara 1 Project (and the wider community in PNG) are fully informed about the Solwara 1 Project. During the development of the Solwara 1 Environmental Impact Statement (EIS), we visited a number of villages and towns in PNG to ensure the views and concerns of local communities were heard. The specific villages and towns were determined in consultation with PNG national and provincial governments. Our commitment to the community does not end with the completion of the EIS or granting of the Environment Permit. Community engagements have continued to take place since the Environment Permit was granted by the then Department of Environment and Conservation (DEC) in December 2009. Representatives from the national and provincial governments accompany Nautilus Minerals during these community engagement campaigns. To date, Nautilus Minerals has recorded the attendance of around 30,000 people at engagements/awareness campaigns held in 46 locations within PNG. Both numbers are still growing. We plan to continue with our community engagement campaigns in New Ireland and East New Britain as we move into the operations phase of the project. We have and will continue to focus our engagement programme on the villages located nearest to the Solwara 1 Project site, the CAB. This area covers the communities who have the greatest interest in understanding the project and this will be where many of our CSR programs will be implemented. MAULUDU: Give an update on the progress of the Solwara 1 project. JOHNSTON: Nautilus has taken delivery of the Seafloor Production Tools (SPTs). They are currently undergoing submerged trials in PNG. The Riser and Ancillary equipment is completed and currently in storage. The Subsea Slurry and Lift Pump is completed and Nautilus will take delivery of it later this year. The Production Support Vessel is currently being built in China and is progressing to schedule.